SeaDream Yacht Club’s 112-guest twin mega-yachts will once again return to the Caribbean for the winter 2015-16 season. Both vessels will ring in the New Year overnighting in St. Barts on sold-out itineraries. 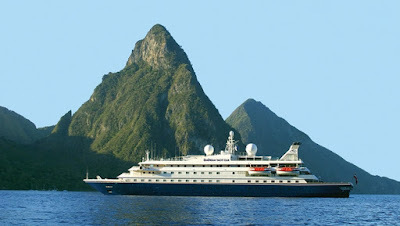 Then, SeaDream I will make its way to the Southern Caribbean for 12 sailings departing between Jan. 3 and April 2. The itineraries will showcase St. Vincent and the Grenadines, Martinique, Guadeloupe, St. Lucia and more. In response to popular demand, three round-trip sailings from Bridgetown, Barbados, will be available, complemented by nine itineraries between Bridgetown and Marigot, St. Martin. The full 2016 Southern Caribbean schedule for SeaDream I is available on the SeaDream website. Shore excursion highlights include a trip to the elite private island of Mustique, which measures just 3 by 1 1/2 miles and is home to Mick Jagger and Tommy Hilfiger, among other celebrities. SeaDream’s signature “Champagne and Caviar Splash” is offered on all 2016 Southern Caribbean voyages. Guests wade into the surf to indulge in premium caviar and bubbles served on a surfboard covered in white linens. Guests then eat a BBQ lunch on a white sand beach and can swim, snorkel or lounge. Inclusive yachting fares begin at $3,499, based on double occupancy.